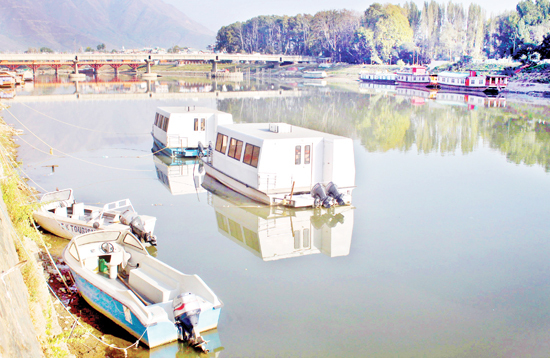 Srinagar, Oct 2: Over a month has passed since State Government launched Jhelum cruise service here in Srinagar to promote water transport and heritage tourism but on ground it has failed to gain momentum as people are showing least interest towards it. The cruise service on historic Jhelum River was started jointly by Department of Tourism Kashmir, Jammu and Kashmir Tourism Development Corporation and the Divisional Administration on August 25 after conduct of over month-long trial by Tourism Department from July 11 this year for the promotion of the water transport and heritage tourism. But later it did not yield desired results. Currently, the Government has kept one cruise at General Post Office (GPO) Ghat near Zero Bridge but hardly anyone turns up for the ride at prescribed time in morning and evening. A house boat owner, who remains present near the Ghat, confirmed that the response to the cruise service has remained negligible. “We hardly see anyone coming here. The cruise remains there only waiting for people. We don’t see any success so far in this project,” he said. The Government has fixed Rs 25 for one side ride from Zero Bridge in Civil Line to Khankah-e-Moulla in downtown city. Earlier, it had fixed Rs 100 per person but after suggestions from various stakeholders, the rate was slashed. The cruise service is scheduled to operate twice a day at 10 am and at 4 pm but on the very first day, it evoked zero response from people and no one turned up for the ride which disappointed all stakeholders and suggested its bleak future. Director Tourism Kashmir, Mehmood Ahmad Shah, said success of the cruise service depends on response of the people. “We cannot force people to come. We have kept the cruise there and the service is operational. Whosoever wants to come can come,” he told Excelsior. The Director admitted that the locals are not showing interest in the Jhelum cruise. “Unfortunately, we don’t have tourists in large numbers also here this time, so that is why there is poor response but people do come for cruise,” he said. The house boat owners near GPO Ghat said the location for cruise service is not ideal and that is “one of the reasons for its failure”. “The Government should have selected better place for operating this service. This GPO Ghat has zero attraction. On the one side, there is sand mining going on and on the other, we have construction of bridge underway. Everything is messed up and that is why no one is coming here. Even a cafeteria at GPO has been shut for want of customers,” they explained. While the situation on ground clearly suggested that the cruise service has failed to gain momentum, Divisional Commissioner Kashmir, Dr Baseer Khan believed the project has been a success. “We have received good response so far. There is a proposal to expand this service further up to Pampore and Anantnag. We will consolidate this project and we expect more success in coming months when we will have large number of tourists here,” he told Excelsior, adding that they will also involve private players into the project.